1) What is the compound interest on Rs. 2500 for 2 years at rate of interest 4% per annum? 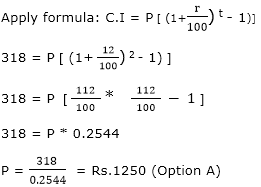 2) What is the amount for a sum of money Rs.7500 at 6% rate of interest C.I. for 2 years? 3) On lending a certain sum of money on C.I. one gets Rs.9050 in 2 years and Rs.9500 in 3 years. What is the rate of interest? 4) Ramesh borrowed Rs. 3600 at a certain rate of interest C.I. and the sum grows to Rs. 4624 in 2 years. What is the rate of interest? 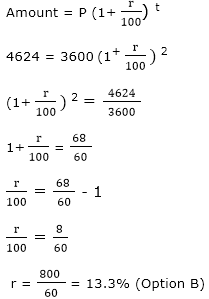 5) On a certain sum of money the compound interest Rs. 318 is earned in 2 years. If the rate of interest is 12%, what is the principal amount?